“Proceedings of the Saint Petersburg Forestry Research Institute” has been quarterly issued by the Federal State-Funded Organization “Saint Petersburg Forestry Research Institute” since 1929. The International Standard Serial Number of our scientific review is ISSN 2079-6080. The journal is included in the system of Russian Science Citation Index (RSCI) and international information systems for agriculture and related industries «Agricultural Research Information System» («AGRIS»). We regularly update the article database. The full-text issues of our scientific review can be found on this website in the section "Archive". The journal is an independent reviewed scientific publication designed to give the researchers and experts’ results of the original researches in the field of forestry (06.03.00), biological (03.00.00) and economic sciences (08.00.00). The subject of the journal covers the following areas of scientific knowledge: silvics and forestry, forest valuation and forest organization, forest crops, genetics, selection and biotechnology, theory and practice of forest conservation and protection, biological bases of forest management, economy, strategic planning and administration in forestry. The Editorial Office welcomes the full text original articles considering the results of theoretical and practical researches on the designated fields of the journal specialization. Besides, the developed reviews of scientific publications, short messages about significant for the theory and practice of forestry results and also data on the held actions of scientific cooperation can be accepted to publication.  The Editorial Office of “Proceedings of the Saint Petersburg Forestry Research Institute” finds it obligatory for authors, reviewers, editorial board members and editorial staff to meet requirements of the "Code of Ethics for Scientific Publications", developed and approved by the Committee on Scientific Publications Ethics and also declares the lack of abuses of official position in the work of the Editorial Office. The researchers with the master degree, postgraduate and doctoral students, scientists and professionals of the forest industry and applied sciences are invited to apply their articles for publication. The payment for the publication of articles in the journal isn't provided. Requirements for the articles can be found in the section "Authors". We will be happy to see you joining the ranks of our authors and readers! On February 19, 2015 in the State Duma of the Russian Federation,parliamentary hearings were held on the topic: “The legal and economic aspects of raisingefficiency and development of the forest sector of the Russian Federation.” The meeting was attended by representatives from agencies of the executive branch of government, constituents of the Russian Federation, the lumber industry, as well as non-profit and environmental conservation organizations. Among the determining factors hindering the development of the forest sector and improvement of the structure of the forestry industry, participants in the hearings cited low innovation, characterized by a meagre share of new technologies introduced into production, as well as the weak influence of research in improving the quality and competitiveness of the main types of forest products. The main theme of the current issue is devoted to the scientific and technical support activities in the spheres of forest fire prevention. We invite our readers to familiarize themselves with a new approach to planning for the amount of specialized technical forest fire prevention measures, the possible applications of flame-retardant screens to deter ground fires, as well as estimates of combustible materials during state forest inventory. In the end of the year it is usual to sum up results and to define objectives and tasks for a forthcoming period. The increased reader’s interest was a consequence of our work on careful selection and reviewing of materials for each issue. Last year the subject of the published articles was considerably enriched and reflected the most significant processes of reforming and innovative development of forest sector of economy. A lot has been recently said about innovative development of different branches of the national economy. It is of no doubt for everyone that there is a necessity to implement new products or technological processes in practice, but still the level of innovative activity remains very low. It also relates to the forest-based sector, a traditional branch of economy. What is the cause of the observed phenomena? Among the main reasons it should be marked that the financing practice of scientific work is not perfect, and commercial approaches to innovative products and services are not effective. Though, as we see it, the key issue here is absence of strategic goals for entities of innovative activity, primarily, the scientific and research companies and enterprises. It is required to evaluate the demand of the forest economy in specific products and services, and the advice on what projects should be rejected as not having potential commercial success or not complying with the basic direction of state politics in the industry. Development of branches of human knowledge based upon the pragmatic approach is the development of view and the framework bears on the subject of research. Forest science displays the picture of human activity in the course of complex use of forests. Specific character of this natural resource also determines the rules ensuring continuous and stable usage. Hence, forest management joins the benefit from satisfaction of human needs in forest products and services with the necessity not only to renew primary resources, but also to respect a variety of environmental and social interests. In 1929 Leningrad (SPb) Forestry Research Institute foundation was laid. The issue you are reading now is an attempt to interpret the history of birth, evolution and implementation of ideas expressed by lots of welland little-known scientists, who have been working in the Institute until nowadays. It is commonly known that the science starts with the problems and develops originating from them to the competing theories that are assessed critically. The method of phenomena historical interpretation is especially developed in the forestry science. This is primarily explained by the duration of the cycle of reproduction in forestry and, therefore, by the necessity of the long-term observations and experiments. In the monograph of A. S. Tikhonov published recently the term “historical cuttings” was used for the first time and the author did not describe the meaning of the term. In our understanding this is the interpretation of the experimental records in terms of historical aspect of the object of observations development. However attention shall be paid here to the danger of the scientific works stalling into tautology, transformation of the object observation process into the mechanical procedure resulting in no new knowledge. This issue presents to the readers the results of the historical method application in the forestry science: review of historical transition conditions to bio-fuel, analysis of the seeds’ mycorhization in the process of reforestation, assessment of experimental data of long-term experience in examination of pine growth and productivity in forest cultures. This issue contains the materials on the experience of carbon budget inventory in the Russian forestry. I invite all parties concerned to participate in the discussion of the forest function in the current global changes. We expect that the interest towards the scientific researches in the sphere of the forests’ response to the climate change as well as losses and damage in the forestry will get the new a shot in the arm. 1. Manuscripts of articles should be transferred to the Editorial Office in electronic form by sending on the official e-mail address (journal@spb-niilh.ru). 2. It is necessary to attach to the manuscript the expert opinion on possibility of publication confirming that the presented materials don't contain the data of National Security Information and (or) Classified Information. 3. Before the editorial board’s decision on possibility of article publication it is necessary to send to the Editorial Office a paper version of the manuscript signed on each page by the authors and also a signed publishing license contract on transfer of non-exclusive rights to use the scientific article. 4. The manuscripts sent to the Editorial Office are exposed to a preliminary estimate on compliance with the journal subject and observance of their formatting rules. The manuscripts which fail to meet the specified requirements are sent back to the authors. 5. After the preliminary estimate the manuscripts go for bilateral blind (anonymous) review. According to the results of review remarks and offers on adding changes into the text of the manuscript or motivated refusal on publishing the manuscript can be sent to the authors who undertake to make necessary changes in the text and to send to the Editorial Office the modified version of the manuscript as soon as possible. The authors can disagree with the proposed remarks and offers that is cause to send a motivated refusal on publishing manuscripts to the authors. 6. The decision on possibility of article manuscript publication is made at a meeting of an editorial board considering the preliminary estimate results and review, volume and subject of the journal issues which are made. 7. At registration of the manuscript it is recommended to follow this structure: introduction containing a current state of a question, statement of purposes and research problems, objects and methods of research, results and their discussion, conclusion or findings. 8. It is necessary to provide with the following data in the main part of the article in Russian: article UDC, article name, full name of authors, annotation (author's abstract), keywords (minimum five), address data (official name of the organization, its postal address, e-mail of all or one responsible author). The similar data in English are given below. 9. Annotation to the article (author's abstract) has to describe the main objectives of the research, to explain how the research was conducted without methodological details, to summarize the most important results and their importance. The text volume of annotation (author's abstract) is defined by the publication contents (data volume, their scientific value and/or practical value) but shouldn't contain less than 100-250 words. 10. Keywords (author's keywords) have to reflect the main article contents, whenever possible not to repeat terms of title and annotation, to use terms from the article text and also terms defining the subject field and including other important concepts which allow to facilitate and to expand possibilities of article finding by means of the information retrieval systems. 11. The original article volume shouldn't exceed 12 pages, the short message or the review should contain 5-7 pages, messages on the held actions of scientific cooperation should have 3-5 pages including drawings, tables and list of references. 12. Text should be typed in Word for Windows using 12-point Times New Roman font, single line spacing. 13. Tables should be made in Word using 12-point Times New Roman font, heading should be typed using 10-point font. 14. Drawings and photos should be placed in the text and applied separately in JPEG formats (300-600 dpi resolution or at least 1000 dots at the smaller side of the image). Making drawings in CorelDraw editor it is necessary to provide with a copy of the initial file. Graphic material should be made in Microsoft Excel and a copy of the initial file should be also provided. 15. Formulas should be typed in the editor of formulas in Word, explanation of formulas letter identification in the text should be made in the text editor. 16. Bibliography should be formed alphabetically according to GOST (Russian National Standard) 7.1-2003 "System of standards on information, library and editorial question. Bibliographic record. Bibliographic description. General requirements and rules of drawing up", and also GOST (Russian National Standard) 7.82-2001 "Bibliographic record. Bibliographic description of electronic resources".